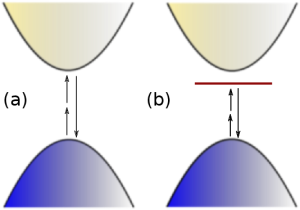 Together with Myrta Gruning we just submitted a new paper on second harmonic generation(SHG) in two-dimensional materials, h-BN and MoS2. We calculated the SHG using a real-time approach that we recently developed. We included both local field effects and electron-hole interaction at the level of screened exchange , without any additional approximation. Our approch is equivalent to the combination of GW + Bethe-Salpeter equation, widely used in linear response theory. We found that bound excitons are clearly visible in the SHG spectra (see the simple picture on the left) and they strongly enhance the SHG intensity.